The period for nominations by members of the Oireachtas will expire at noon on Monday 21 March 2011. The Seanad Returning Officer will sit for the completion of the panels on Friday 25 March 2011. Interesting Fact: The Roscommon constituency was abolished for the 1969 general election, and recreated for the 1981 general election. 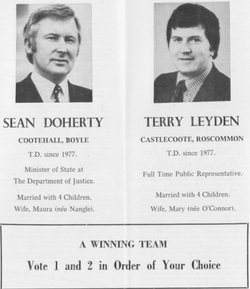 In the intervening period County Roscommon was represented through the Roscommon-Leitrim constituency. In 1997 (Link)I tried unsuccessfully to regain the seat in Dail Eireann.